In our packet, you travel all by yourself, Southamerica planet take care for you, we reserve all your hotels and transport. When you arrive in Argentina you find in your first hotel an envelop with all the vouchers for hotels /buses and excursions. The excursions you do in International groups with English speaking guides. Our local agent arrange also your transfers and give you the bus tickets to go from A to B, like this, you travel around by yourself but without worry’s , all arranged thru southamerica planet. If there are any problems, you always find support by contacting our offices! * All your vouchers, information packet, like general info over all the places you visit. * Your food, in the hotels is breakfast included. * The entry fees and taxes, like airport tax. 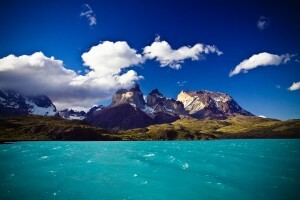 The most southern point of Latin America, dividing Chile and Argentina, is Patagonia. It is one of the most capricious mountainlandscapes in the world, a last impressive breaking loose of the Andes before going under in the sea. But it is also a country of endless splendid untouched nature, penguins, glaciers, dolphins, whales. We cross over Patagonia by bus and plane concerning a very large distance, certain is that you return homeward with pure lungs and a lost heart for this nature ! As extra you get a visit to the water falls of Iguazu ! * Ushuaia, the end of the world! 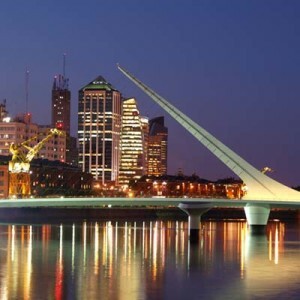 Arrival in Buenos Aires George chavez airport, the transfer pick you up, at the airport and bring you to your first hotel in centre Buenos Aires. To do this, we need your flight number and hour of arrival in advance !! 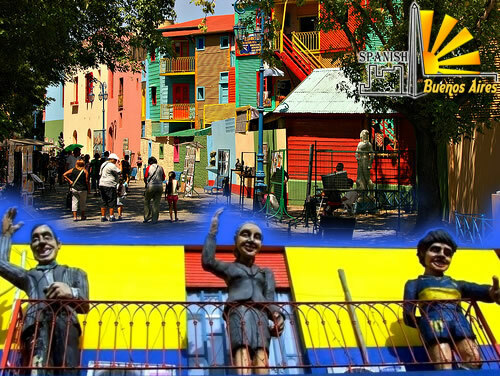 This first day quietly, after a long flight you have enough time, the complete day to discover this fascinating sparkling capital of Argentina. The city has several districts with each an other face. The best picture of the city you get by undertaking an excursion with a bicycle and guide along these districts ,the Plaza the Mayo, Casa Rosada (the rose presidential palace), Theatre Colon, Boca football stadium ,the worker district which has been built entirely around the stadium of Boca juniors with its colourful houses.Included in this Packet Football is and remains very important for Argentina here lives still the football fever! 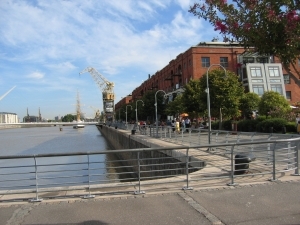 You can visit the football stage in a tour, the port “Puerto madero” is also worth the effort, with its an renovated dock with nice restaurants, the tango neighbourhood of “San Telmo”, this is the heart of Buenos aires with many antique shops and especially the “TANGO” .Palermo” is the richer neighbourhood with a lot of parks ,Recolette is the nightlife busy place,,, around the cemetery where the very well-known “Evita Peron” try to rest, or visit the famous café Tortoni. 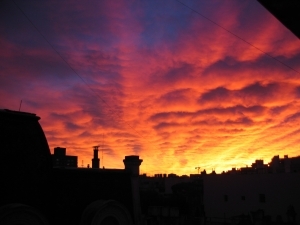 You see sufficient and even too much to discover in this city , evenings in Buenos Aires are also an adventure .From sparkling nightlife, to excursion tango/diner shows enthusiastic till early morning. You can in the evening also enjoys Argentinean wines and huge steaks on the BBQ . Today we take a flight to Calafate. In Calafate a transfer brings you to your hotel in Calafate. In Calafate, which have the environment of a ski resort village, we enjoy our nice hotel in 2 person rooms with bathroom. If you want you still can visit the Laguna which lies walking distance from your hotel or you still can go on (excursion) horse ride. Today we take the bus for 3 ½ h to Chalten,(depending hour of arrival in Calafate ). 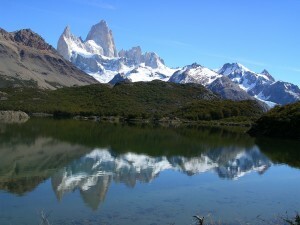 Chalten is situated in the national park los Glaciares. This is the Southern point of the Ice cap, to the foot of the Andes-mountains. It’s the starting base for exploring the Fitzroy mountains. 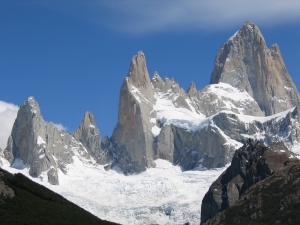 Here is the Cerro Torre (3100 m.) and Cerro Fitzroy (3405 m) who dominate the horizon. 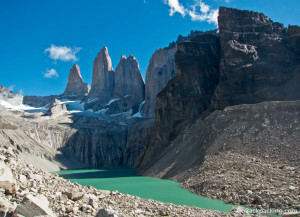 From Chalten starts the splendid trekking. A rising path by half forests area brings you to Laguna Torre, from where you have a splendid view to the almost vertical boasted granite rock points, covered with snow. This walk lasts approximately five hours. The torres are similar with the torres in Torres del Paine on the Chilean side, to you to decide which is the most beautiful! 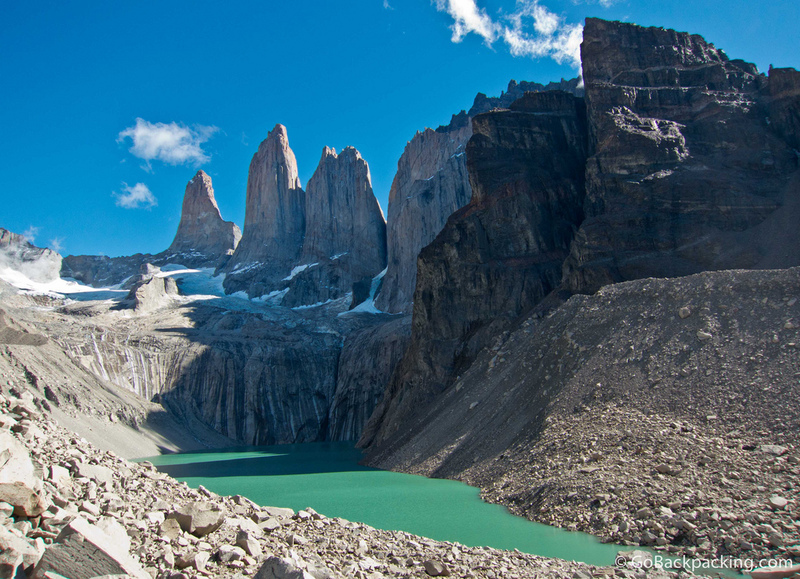 Chaltén have many different walks. To the Laguna the lose tres for example, where you stand on the foot of Cerro Fitz Roy with an overwhelming overview, very impressive! This walk is approximately 25 kilometres. In Chalten we stay in a hostel for 1 Night . 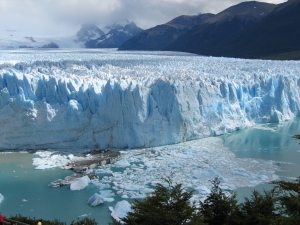 Calafate is the base for a visit to the giant Perito Moreno-glacier, Included in this packet! which leads to an altitude of 60 a 70 m.and concerning a length of several kilometres in the immense Lago Argentino. The approximately fifty glaciers in the park forms the largest compact ice mass on the earth. Another highlight during this travel. 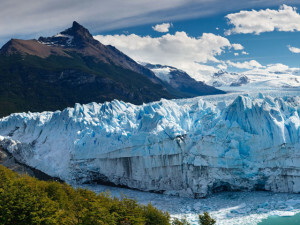 The glacier, one of largest in the world, lies on approximately eighty kilometres from Calafate. The Perito Moreno glacier ensure spectacular moments if there giant scraps demolish ice, which floats into the blue glacier lake .The blue coloured ice, sighs and cracks already millions years under the billion tons of weight, he moves itself approximately six meters per day an unique experience ! You can approach also the glacier closer with a boat as excursion. Also an ice trek excursion on the Perito Moreno is for a lot of us truth excitement! Optional/With some pins under the shoes you go up the glacier. Accompanied by a glacier guide. 1 ½ h you climb over the working ice, surrounded with nothing ells than ice with strange forms. Superb blue pools of melt water are varied with walls of ice and snow. You have splendid view concerning these enormous ice mass and finish at a small bar, where they give whisky on the rocks, so you can taste this world wonder also ! You don’t need any experience or condition. You can make in this excursion certainly the most fantastic photographs! People, who want, can make optionally (excursion) a cruise to the Upsala glacier in the Onelli bay. During this excursion you see glaciers with ice walls of 60-80 m. altitude! This morning you leave early direction the border of Chile. This road is unpaved, with scenic views. You sure see the Andes-condor, this is its biotope ! Its the biggest bird, its wings are as wide as 3 meter .After some hours bus we arrive at the border of Chili .Here we change bus and go direct to the National park of Torres del Paine. This is undoubtedly one of the most spectacular national parks! This large park has been named after to the three important granite towers. It has a large variety of plants – animals and with snow covered mount tops, waterfalls, glaciers and the blue-green glacier milk. Mountain lakes are all over the landscape. We even see a lot of guanaco’s and with some luck a puma! The bus drop us at Refugio Torres . In the splendid park we sleep in Refugio’s, these are comfortable shelters. There are bunk beds, shared sanitary, rooms for 6 or 8 persons and you can buy healthy and nutritive meals. The Refugio, s can change according to availability. But generally we sleep 3 nights in Refugio torres. You can do longer or short treks depending your own conditions. The splendid Laguna in front of the torres viewpoint is a highlight for many of us. But it is a steeply climb ! Count on 6 h go and back to viewpoint and lake in front of the granite torres. Certainly worth the effort! On day 2 you can walk to grey glacier if you take at own costs the boat from pudette or you take a walk along the banks of the Lago Skottsberg and Nordenskjold concerning the path ` Sendero Paso loose Cuernos. On the road you see the Frances-gletsjer and some impressive mountaintops, among which the Punta Bariloche (2600 m), Paine grande (3050 m), Cuerno Principal (2600 m) and Paine Chico S. (2668m). You touch certainly splendid viewpoint! Also the surroundings of the park are splendid to make as excursions a Horse ride (excursion.) If you will sleep in other Refugio’s you have to tell us far in advance! This morning we leave the park and go to administration. From here the bus takes you to Puerto Natales. In Puerto Natales you go by yourself to the bus station and take the local bus for about 4 h over paved road to Punta Arenas. This city lies on the southern point of Chili. Its just a stop over to make the trip to Ushuaia not to long .Punta Arenas was popular in the 17e and 18 th century .Today its an important traffic port for boats. In the evening you can take a walk in the nice colonial centre. The cementerio municipal. The cemetery is a public museum, real worth a visit. Taste also the delicious salmon they serve in Punta arenas . The bus ride to Ushuaia takes a whole day, (NOT ON SUNDAY ! ). Transfer to busterminal. First to Rio grande, from here its an other 4 h to Ushuaia. That’s why you leave very early in the morning. We also take the ferry crossing the street of Magellanes. This is the land of the Yahgan-indians, the mysterious “Fire Land. The name fire land has been considered by the Spaniards, they saw Ushuaia from their boats with a constant red smoke for sunset. Also the Beagle-canal is very famous. The mountain tops around the city become almost the whole year cover with snow and ice. 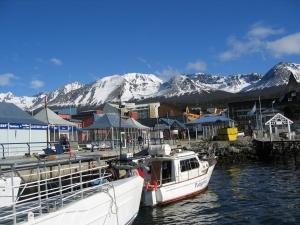 Ushuaia is the most Southern city in the world, after a military base. At the port are frequently large vessels, cruising ships for Antarctica and sailboats of world travellers. Tourism in the last years strongly increases and it seems that its the most important source of income to become. The Argentinean Navy is also present, particularly to protect the disputed and claimed part of Antarctica. You spend the night in one of the picturesque hotels. 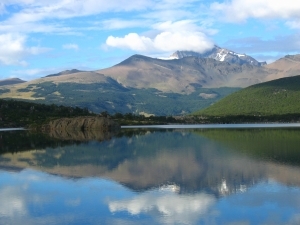 The national park Fin del mundo, have splendid excursion possibilities.Tierra del Fuego have a lot to offer, here several walks are possible. The park is situated a half hour drives of the city and exists from a mount landscape with grass countries, confesses, lakes, fjords and splendid dense bunches of coihue. 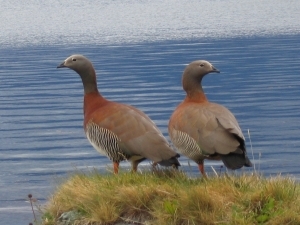 Undoubtedly you see the Cauquén, a goose type who is not shy and regularly visit this area. The walks are not heavy and pass through concerning mount slopes, bunch and along the masonry bank of the Lapataia bay, you can see Chile. Included in this trip is a pleasant tour to Fin del mundo nat parc in this pure nature! In the evening you can have a meal with “Centolla” or traditional Asados”. Centollas are the largest crab in the world which is caught in the Ushuaia bay. This bay colours in the evening sometimes totally red. Included is also a boatride thru the Beagle channel. From Ushuaia flight to Buenos Aires where you can walk around in the city. 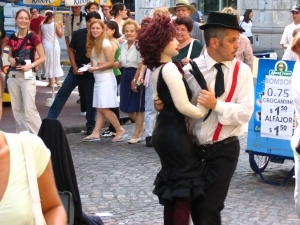 If this day is a Sunday you can visit the San Telmo Tango market. In the late afternoon you take the real luxury bus for about 18H to Iguazu. Don’t be afraid of this! It’s a luxury bus with services a board ,with meals , double space seats ,movies ,,,,,Its also good to relax and rest ! With the bus we go slowly direction jungle with higher temperatures . You arrive around lunchtime in Iguazu. Its situated northeast of Argentina, in the province Misiones, with his world famous waterfalls and his subtropical fauna and flora. Most of the time we stay in Foz do Iguazú on the Brasilian side, but sometimes in Iguazu. These places are situated very close to each other, its a must to visit both sides of the waterfalls. The park on the Argentinean side, also have beautiful walking trails with suburb views over the waterfalls. The mild climate invites us to relax after the long bus ride, at our swimming pool ! 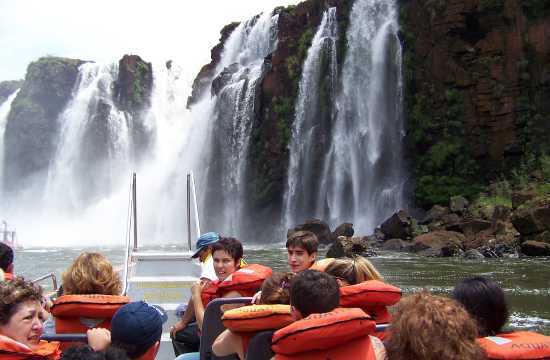 These 2 days you have 2 excursions, included, full day to the world famous and impressive Iguazú-waterfalls Argentinian side and 1 day Brazilians side. The views are amazing! 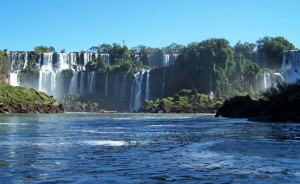 The impressive waterfalls are situated at the border of Brazil, Paraguay and Argentina. 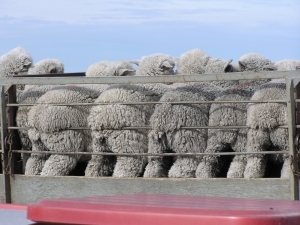 They are not the highest but the widest in the world! About 275 big and small waterfalls coming down over a distance of 3 kilometre ,with around 80 meter of depth ! This impression and overwhelming noise of the water coming down you never forget, for sure you also get wet! There are many tropical animals who are used to tourists. On the Argentinean side, you walk till almost in the waterfalls, the views from the walking pads are suburb! You have enough time to enjoy this beauty of Mother Nature. The highlight is the visit to the biggest waterfall ‘Garganta del Diablo’. You also can do some treks in the jungle around the waterfalls . One of the most spectacular excursions is the boat ride, this go very close till even under the waterfalls! Its fun and adventure and gives you breathtaking pictures of these falls!!! We guaranty you get wet! The next day you have the Brazilian side excursion, the Optional helicopter flight over the waterfalls is amazing! This is a breathtaking experience! Like this you have a perfect impression on how big this falls are! Also the bird park is worth a visit, excursion. You walk between the Toucan’s. The Brazilian side gives you the best overview of these impressive waterfalls. People who like can do the excursion to the dam of Itaipu, one of the biggest dams in the world who gives electricity to a big part of Brazil and Paraguay. Today we go back direction Buenos Aires, here you can do your last shopping for souvenirs. You stay in our nice hotel. The people who like can visit this night as excursion, one of the Tango-diner shows or a performance in the famous theatro Colon. * All services mentioned in above offer, except for optional services. * Domestic flights, unless otherwise mentioned. * Departure taxes or reciprocity fees. * Not specified meals, optional excursions and tips. * Entrance fees to National Parks, unless otherwise mentioned. * Gasoline, parking costs or other car expenses in case of car rental. Domestic flights can most probably be cheaper arranged via an Air pass of the destination. Please check your own flight/IATA contact. Flights stated in the proposal are example flights; therefore flight times and prices are subject to change. Not before southamericapanet has received the full payment of the booked flights on their account, the flights can be printed. Up until that moment flight prices, times and availability is subject to change. 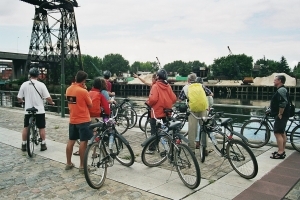 – Travel itineraries are on base of availability of the locations by booking. Hotels/providers can still implement price changes; therefore prices are subject to change in case no reservation and down payment is made. Travel itineraries are excluding (National Park) entrance fees, unless this is otherwise mentioned in the proposal. – 24 hour per day accessible by emergencies. The emergency phone will be forwarded in case for any reason the emergency phone is not instantly answered. In this case we ask you for your patience, as the forwarding takes a few minutes. – Drinks are not standard included in the meals. – At arrival in Buenos Aires the passenger obtains an information package with travel information, map of Buenos Aires, vouchers and if applicable a route description and bus tickets. – In case the passenger wants to make alterations to the travel itinerary while already being in South-America, any extra costs will have to be paid by the passenger himself. – A good covering health & travel insurance is obligatory.